Perry Beeches SSS swimming club follows the Swim England Learn to Swim Framework, and follows a 13 week teaching cycle. The Swim England Learn to Swim Pathway is an all-inclusive programme which takes the non swimmer from his or her first splash to developing confidence and competence in the water. 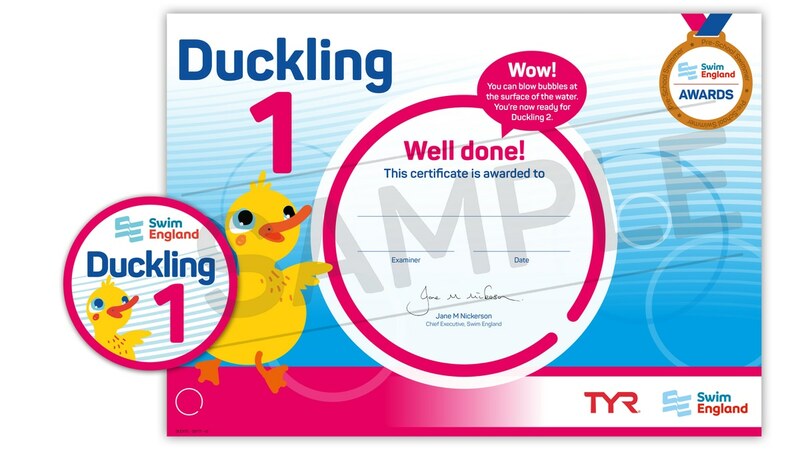 07/02/2016 All AwardsDuckling Awards are the next step on from the Discovery Duckling Awards. 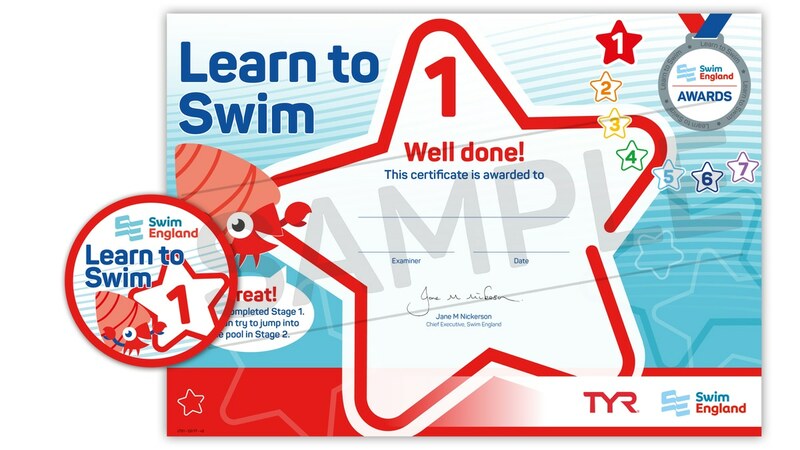 07/08/2018 All AwardsThe Learn to Swim Stage 1-7 Awards are divided into progressive stages. They make up the core, national syllabus of learning to swim for primary school aged children. Correctly identify three of the four key water safety messages. 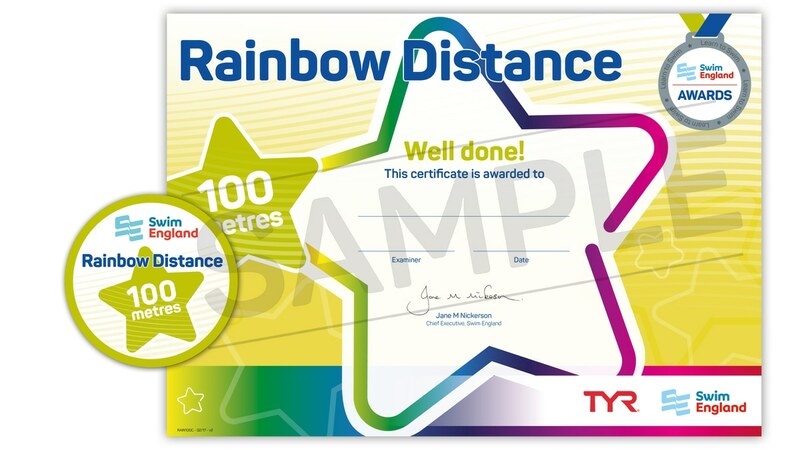 09/03/2016 All AwardsThe Swim England Rainbow Distance Awards are designed to complement the 10 different stages of the Swim England Learn to Swim Programme. 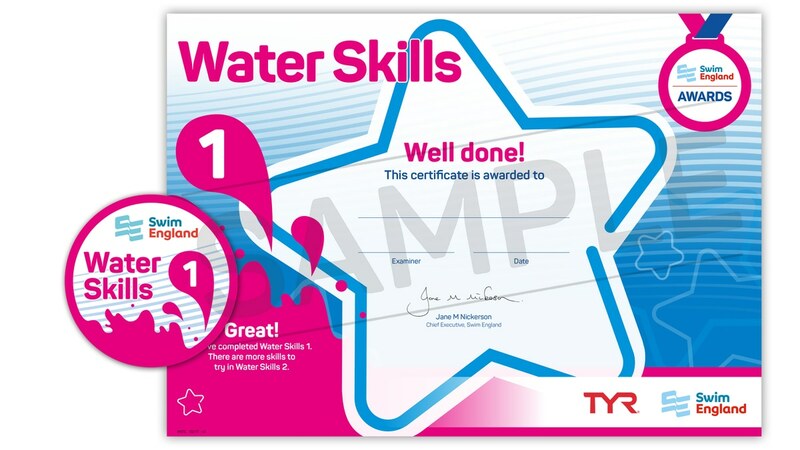 13/11/2015 All AwardsThe Swim England Water Skills Awards support intensive activity programmes and reward your child for successfully developing eight out of 10 skills across six grading levels, or six out of eight skills if your child has a disability. The six Awards are represented by six colour-coded certificates and accompanying badges and focus on confidence, versatility, skills and endurance. By the time your child succeeds at Water Skills 6, he or she should be able to swim 75 metres within two minutes using three different strokes. Enter shallow water from the poolside in a safe manner. Assistance may be provided via the steps or from the poolside. Move across the pool with the water surface no lower than shoulder level. Submerge the face in the water and blow bubbles for three seconds. Push and glide from the poolside or bottom on the front and change to a resting or standing position. Push and glide from the poolside or bottom on the back and change to a resting or standing position. Travel on the back a minimum distance of 5 metres. Travel on the front a minimum distance of 5 metres. Rotate from the back to the front position and change to a resting or standing position. Propel a floating object (e.g. a ball) for 3 metres by any method. Demonstrate a flat or upright stationary floating position for 10 seconds. Enter shallow water unaided from a standing or sitting position without the use of steps. Submerge the head completely and blow out under water for a minimum of three seconds. Hold a tucked floating position for a minimum of five seconds (this may be on the front or back with the face submerged or kept out of the water). Swim one width on the front using a crawl-type front paddle propulsive action. Swim one width on the back using a crawl-type leg action. Swim one width on the front or back using breaststroke type action. Swim one width full stroke on the front or the back with arm recovery over the water. Demonstrate a flat upright or upright floating position for 20 seconds. Demonstrate a 360 degrees turn or roll – from a flat or upright position without making contact with the pool bottom. Swim two widths without pausing using any stroke or strokes. Swim four widths without a pause using any stroke or strokes. Submerge in shallow water and retrieve an object from the pool bottom using both hands. Tread water out of standing depth using arms and/or legs for 20 seconds. Swim two widths on the front demonstrating good technique. Swim two widths on the back demonstrating good technique. Swim a minimum of 10 metres showing three changes of direction without touching the side or bottom of the pool. Scull head first for 5 metres. Swim through a hoop submerged in water of shoulder depth. Swim continuously for one minute using two different strokes and with good style. Jump into water of at least full reach depth* and swim 25 metres without touching the side or bottom of the pool. Surface dive in water of at least full reach depth* demonstrating good technique. Perform a forward somersault using a push and glide if necessary. Swim breaststroke or front crawl for 25 metres showing good technique. Swim backstroke for 25 metres showing good technique. Scull head first for 5 metres and return sculling feet first. Swim a minimum of 5 metres using a dolphin leg action. Swim two widths of any stroke including a ‘correct’ turn complying with Swim England expected standards. Enter water of at least full reach depth* and tread water for 20 seconds followed by a 25 metres swim. Tread water for 30 seconds followed by a 25 metres swim, which includes passing through a submerged hoop. Perform a backward somersault using a push and glide if necessary. Perform a surface dive in water of at least full reach depth* followed by an underwater swim of at least 5 metres. Swim 50 metres in 90 seconds. Swim 25 metres using an inverted breaststroke or backstroke. Perform a head first entry into water of at least full reach depth* and swim 25 metres of front crawl. Swim one width of front crawl finishing with a forward somersault into the poolside and a push and glide away on the back or front. Swim one width of butterfly. Jump into water of at least full reach depth* attaining a good height and upright position in flight. Swim 25 metres propelling a ball and maintaining close control throughout. Swim 75 metres within two minutes using three different strokes and demonstrating good technique. Perform the following skills consecutively and without pause: head first scull for 5 metres; somersault; feet first scull for 5 metres and a 360 degree rotation in a vertical tucked position. Swim three widths of front crawl showing two appropriate turns and demonstrating good technique. Swim three widths of backstroke showing two backstroke turns and demonstrating good technique. Swim three widths of breaststroke showing two breaststroke turns and demonstrating good technique. Perform two jumps into water of at least full reach depth* gaining height and taking up a different position in flight selected from straight, tuck, pike, turning and somersault. Propel a ball for a minimum distance of 25 metres controlling it throughout and demonstrating two changes of direction of atleast 90 degrees. Plunge dive into water of at least full reach depth*, holding the glide for 5 metres. Plunge dive into water of at least full reach depth* and tread water for one minute.